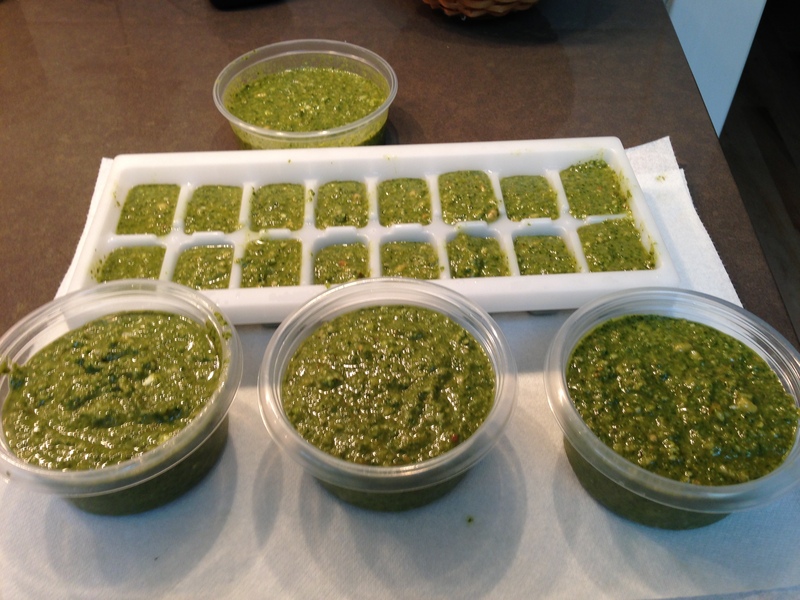 There are many versions of “pesto” made with a variety of ingredients. For the purist, true Pesto Genovese comes from the Genoa region of Italy and was traditionally prepared with a mortar and pestle. Tasty, but very laborious! This blender version was published in the New York Times Cookbook, in 1979. At that time, the cookbook was a collaboration of Craig Claiborne, New York Times restaurant critic and Pierre Franey, a French chef that wrote a column for the New York Times, “60 Minute Gourmet” (later published into a cookbook, which I highly recommend). The New York Times Cookbook was given to me on my 21st birthday and this recipe has been a staple in my repertoire ever since. 1. Remove the tough stems from basil. Pack the leaves gently, but firmly into measuring cup. 2. 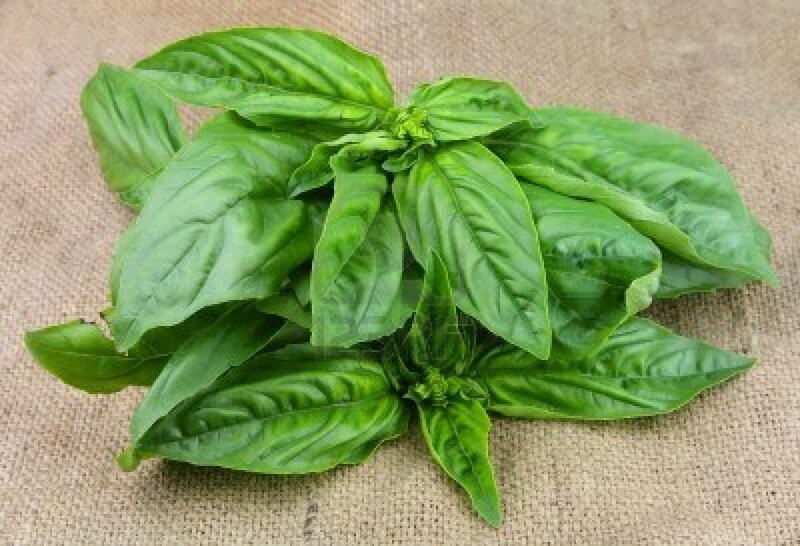 Empty basil, pine nuts and garlic cloves into food processor or blender and blend at high speed. Scrape down sides occasionally to blend evenly. With machine running, add the olive oil in a steady stream. 3. Pour mixture into a bowl and beat in the grated cheeses by hand. Beat in the sweet butter. 4. Refrigerate. Bring to room temperature when ready to use. Notes: If using Parmesan only, add ½ tsp. salt to the mixture. Add garlic to taste, but please note that the flavors intensify after 24 hours. To slow down oxidation, add a thin layer of olive oil to the top of the pesto. Freezes extremely well! Pesto is a flavoring agent—with its assertive flavors, a little goes a long way. 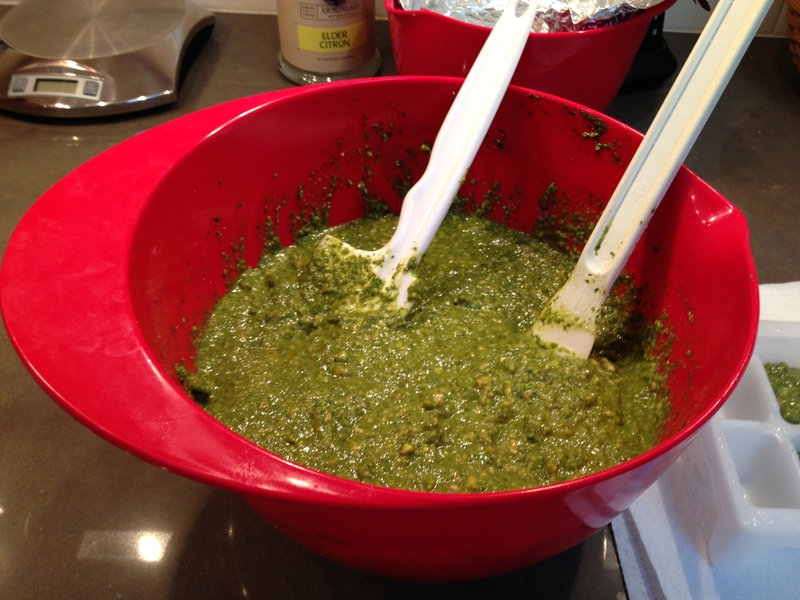 To add to pasta, heat ¼ cup olive oil in a small sauce pan, add 2 Tbsp pesto and mix well. Mix with your pasta and sprinkle liberally with Parmesan. Pastas such as rotelle are best, as the sauce will cling to the nooks and crannies. However, spaghetti or linguine always work well in a pinch! Add to soups, scrambled eggs, salad dressings and veggies. It’s limitless. 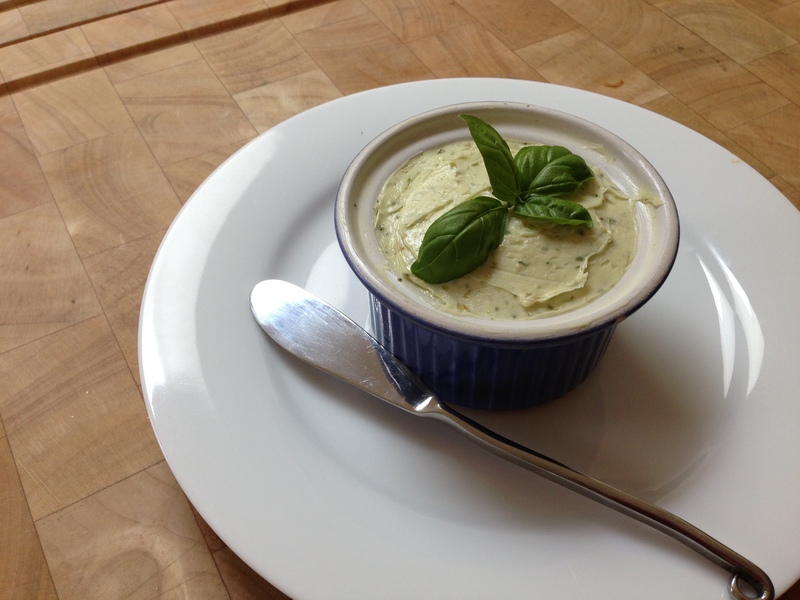 Pesto butter for garlic herb bread: add 2 Tbsp. pesto (room temperature) to 1/2 c. sweet butter (room temperature). Blend and store in the refrigerator. Keeps several weeks. 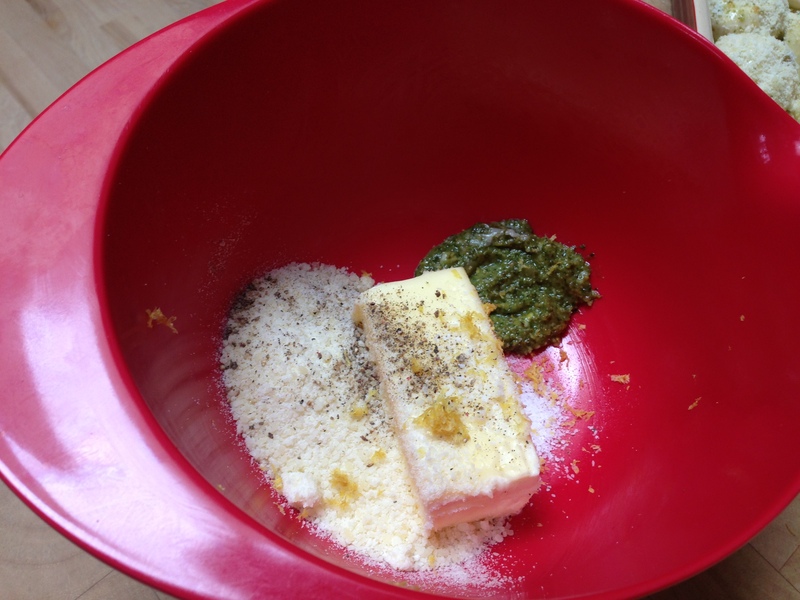 Pesto butter for meats: Mix together: 2 Tbsp. 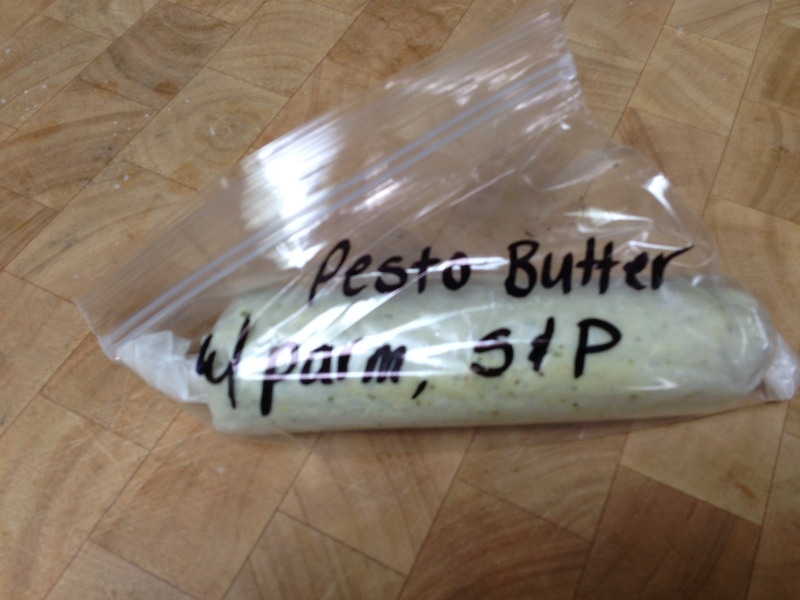 pesto (room temperature), 1/2 c. sweet butter (room temperature), 1/4 c. parmesan, 1/2 tsp. kosher salt, 1/2 tsp. freshly ground pepper, 1/2 tsp. lemon zest. Place the mixture onto wax paper and roll into a 1 1/2″ diameter log. Freeze until ready to use. Top grilled burgers and steaks with a 1/4″ slice of butter. The best wine pairing that will stand up to the strong flavors of Pesto Genovese are a Chardonnay, and a white Burgundy or Chablis. Look for buttery flavors with a heavy mouth feel. Although Americans are trending towards the Pinot Grigio, Pinot Gris and Sauvignon Blanc, the flavors of those wines will be lost and can’t compete with Pesto Genovese. More recipes using pesto to follow!